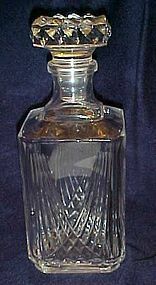 Nice heavy crystal clear crystal decanter with matching stopper. Pretty drape design. Pristine condition.Please send you zip code so I can calculate shipping. This is very heavy. Measures 10" tall including stopper.